Many hunters know the desperate feeling of searching for a treestand as the sky goes from black to gray. These hunters spread scent across their hunting area, walk up on other hunters and simply ruin the morning hunt. The Beacon is a light in the darkness. Hang the Beacon on the treestand or hunting location with the convenient hanger/antenna, then when approaching in the darkness, hit the remote control from up to 200 yards away and the Beacon will guide you to the stand. 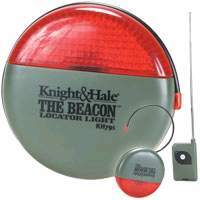 The Beacon also is great for marking downed game, locating duck blinds and anything else that you need to return to in the darkness. Perfect for • Treestands • Duck Blinds • Goose Pits • Marking Downed Game • Alerting Others to your Hunting Area • Many, Many More Uses. Blue case with an ultra bright BLUE LED. Light weight, less than 1/3 oz. Rugged and water resistant. Practically unbreakable LED. Lithium battery, reliable over 10 years of shelf life. Burn time over 10 hours, 10 times traditional flashlight. Handy latch-on key chain. Lifetime warranty from manufacturer. Back ordered less than a week. Green case with an ultra bright GREEN LED. Light weight, less than 1/3 oz. Rugged and water resistant. Practically unbreakable LED. Lithium battery, reliable over 10 years of shelf life. Burn time over 10 hours, 10 times traditional flashlight. Handy latch-on key chain. Lifetime warranty from manufacturer. Back ordered less than a week. Red case with an ultra bright RED LED. Light weight, less than 1/3 oz. Rugged and water resistant. Practically unbreakable LED. Lithium battery, reliable over 10 years of shelf life. Burn time over 10 hours, 10 times traditional flashlight. Handy latch-on key chain. Lifetime warranty from manufacturer. Back ordered less than a week. Yellow case with an ultra bright YELLOW LED. Light weight, less than 1/3 oz. Rugged and water resistant. Practically unbreakable LED. Lithium battery, reliable over 10 years of shelf life. Burn time over 10 hours, 10 times traditional flashlight. Handy latch-on key chain. Lifetime warranty from manufacturer. Back ordered less than a week. Clear case with an ultra bright WHITE LED. Light weight, less than 1/3 oz. Rugged and water resistant. Practically unbreakable LED. Lithium battery, reliable over 10 years of shelf life. Burn time over 10 hours, 10 times traditional flashlight. Handy latch-on key chain. Lifetime warranty from manufacturer. Back ordered less than a week.